72030-CZ is rated 4.4 out of 5 by 14. Rated 4 out of 5 by Icare2 from Updated Review Thanks to Delta’s prompt reply, they immediately shipped me a new disposal flange set, and it does hold water! I wanted to use it for a couple weeks before replying. If water is swished around much, the stopper does flip out of position, because it is not very heavy. And I cannot see how this one is different from the previous two. I am only reserving a star, because I worry what will happen when the rubber gasket wears out. If Delta provides replacement rubber baskets as needed, I will give 5 stars. Love the matching faucet, and appreciate their outreach very much! Rated 2 out of 5 by Icare from Stopper does not hold water My disposal drain basket also does not retain water. The seller sent me a replacement, which was no different. I have a gorgeous and expensive new Delta Cassidy champagne bronze faucet with both matching drain basket and disposal basket, but cannot fill one sink with water! I welcome a solution, and I would like to consider Delta for my two forthcoming bath remodels. I hope there has been a design correction. 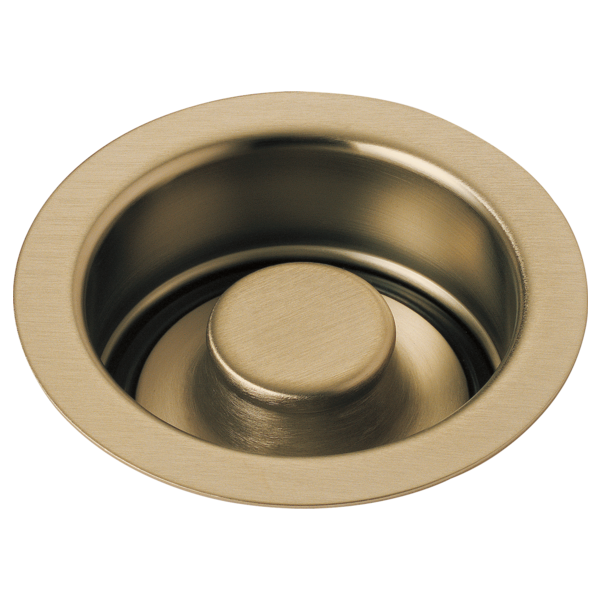 Rated 2 out of 5 by gutblue from We have two sinks with this flange and stopper and both leak around the stopper so quickly we can't do dishes without refilling sink several times. We have two sinks with this flange and stopper and both leak around the stopper so quickly we can't do dishes without refilling sink several times. Rated 5 out of 5 by Leslie Onsager from Essential and great quality Delta never fails to deliver quality. This flange and stopper will serve the user well. No drawbacks with this product. Most plumbers appreciate the ease and serviceability of Delta Brand products. Rated 5 out of 5 by eLInteriors from Works well! This flange is working nicely and looks great! Rated 5 out of 5 by AmeliaM from Quietly doing its job This is an item that I haven't thought much of once it was installed. It does its job, installed easily, and all is well five years later. Rated 5 out of 5 by Smyers from Nice flange There isn't a whole lot to say about a flange, unless of course it doesn't perform it's function. This one does a perfect job and looks nice while doing it so no complaints! Will this fit in a sink drain hole that measures 3-7/8&quot; (98mm)? I also would like to know that about 72010-CZ. Hello, Do you guys offer the extended version of this finish basket? i am putting in disposals on fireclay sinks. if so do you have the part number? My composite sink only has ONE HOLE , is there a strainer part to stopanuthing from falling into the disposal hole? Will the kitchen disposal and flange stopper work with an Insinkerator garbage disposal? Is the fit universal in traditional sink? We want to purchase two, one for each side of the sink -- to match the Delta faucet. Thank you. Will this work with a fireclay sink? To my understanding, a fireclay sink requires an &quot;extended&quot; flange. Does this model fit Insinkerator disposers? Thank you for your question. Delta Faucet model # 72030-AR is 4 1/2&quot; in diameter. You will need to check with the manufacturer of your diposal to see if that will fit.